When you bake a batch of ‘soft’ chocolate chip cookies and they come out hard as a rock. 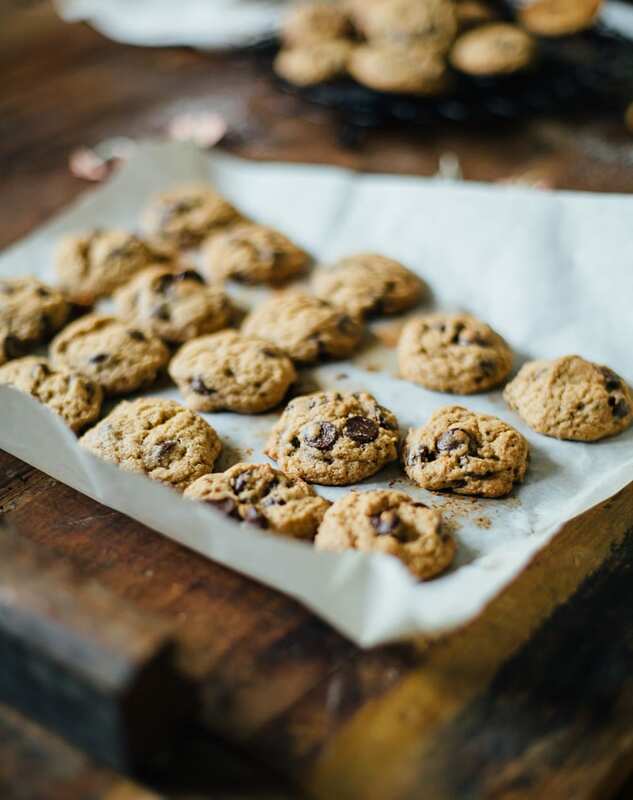 I’m happy to report that this particular cookie recipe delivers on its claim; they’re soft, chewy, and retain their texture even on the second and third day. And no, these cookies do not taste like vinegar at all. Not even close. Something magical happens when vinegar and baking soda join forces lending a tenderizing effect to cookies, doughs, and other baked goods. It’s like a culinary science experiment. In fact, we used to add cider vinegar to pastry dough back when I interned at a restaurant. It makes the crust incredibly flakey. In addition to vinegar, the combination and amount of sugars (granulated, brown, honey) also contribute to the soft and chewy texture. You’ll see. And one more thing worth noting- these cookies are made with 100% white whole wheat flour. White whole wheat is made from bran lighter in color and more mild in flavor than traditional whole wheat flour. It also yields a smoother (as opposed to grainy) texture. This comes in handy when you’re trying to fool your little ones and/or significant other into eating a healthier cookie (no one has to know!). And you can thank King Arthur for the recipe. I got it from them! Tips: FOLLOW THE RECIPE EXACTLY AS WRITTEN. If you do this, they will come out nice and soft. Substitutions: Ok, so ignoring my own advice (above) I made a few minor swaps based on what I had in the house. They all worked, that’s why I’m mentioning it here. I did however, follow the mixing order and baking directions exactly as written. This is key. Also, the original recipe calls for espresso powder. I left that out because: kids. You’ll also notice a range in chocolate chips ( 2 2/3- 3 cups). We all agreed that 2 2/3 cups was the way to go. Make-Ahead: These cookies can be made up to 2 days in advance and still remain soft. By the third day, they are really soft. Also, you could freeze the dough in 1-inch balls (use a mini ice cream scoop) on a parchment lined baking sheet. Transfer to a ziploc bag when frozen. I haven’t tested the amount of time needed to bake these cookies, but from frozen, I would bake until just underdone (similar to when baking fresh). Just keep your eye on them. *White whole wheat is made from bran that is lighter in color and more mild in flavor than traditional whole wheat flour. Preheat your oven to 350°F. Line 2 rimmed baking sheets with parchment paper. In a large bowl or using an electric stand mixer, beat together the butter, sugars, honey, vanilla, and salt until smooth. Mix in the vinegar, egg, baking soda, and baking powder. Add the flour, a little bit at a time, followed by the chocolate chips. Mix until just combined. Portion the dough using a mini 1-inch ice cream scoop (or a tablespoon) onto your lined baking sheets. Bake for 10 to 11 minutes until the cookies are barely starting to brown. They might look too light in color and underdone, but this is what you want. If you over bake them, they won't be soft. Note: if you're using a darker cookie sheet without parchment, bake for a shorter period of time. When finished, remove the cookies from the oven. Cool on the tray for 10 minutes. These cookies sound great – and that is something coming from a dyed in the wool crisp cookie aficionado! I have always marveled at the tenderizing effect of vinegar. My Hungarian grandmother (as opposed to my Italian grandmother) used to add white vinegar to her pie crust rather than water, and her crust really was superb. So indeed there is something to it. I am also quite a fan of KAF White Whole Wheat Flour. To be frank, I find KAF Whole Wheat Flour to be almost overpowering in its whole wheat flavor. Don’t get me wrong, I like it, but it really has the most “whole wheaty” taste on the market, so I find their white version quite agreeable. I hope things are going well for you, these cookies make life seem sweet indeed. I’m so intrigued by the vinegar!!! these cookies look amazing!!! Your blog is so lovely and colorful! It’s a pleasure to read it. 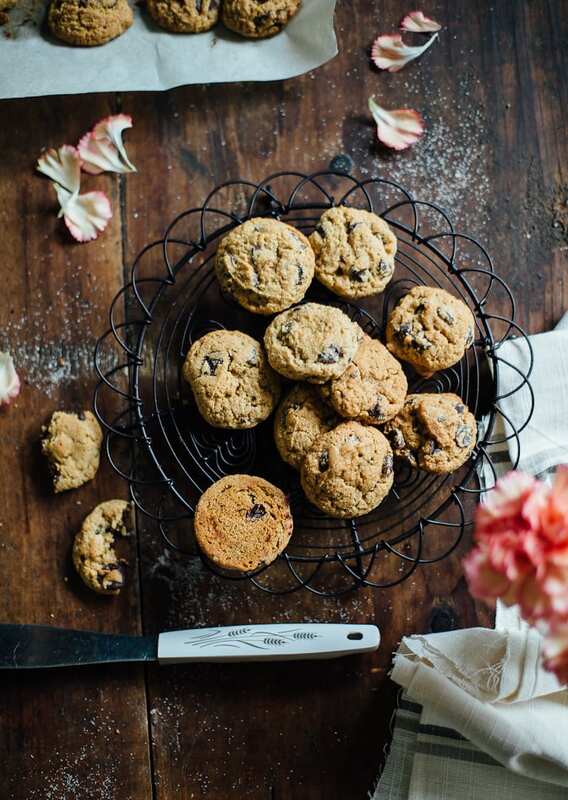 I love the idea of making whole grain chocolate chip cookies. These sound wonderful! This is exactly why I love reading this blog. I learn so much. Seriously, I knew that vinegar is magical but not to this extend. Very cool about the vinegar. I’ve used it in pastry crust but not in cookies. I’ll have to try it out! Oh my goodness I have gotten hockey pucks before! Not only is it frustrating but it’s kind of embarrassing when you were the one assigned to make chocolate chip cookies for your company potluck. I love that tip! Who would have know that it was vinegar. I will definitely be using that next time now doubt! These cookies look yummy! Wow, what an awesome tip Emilie! Thanks so much for sharing! These look wonderful! I’m all about a soft chocolate chip cookie and that vinegar tip is new to me, so now I need to whip up a batch this weekend :). Excellent recipe choice! This KAF recipe has been a top drawer favorite in our house for a number of years. 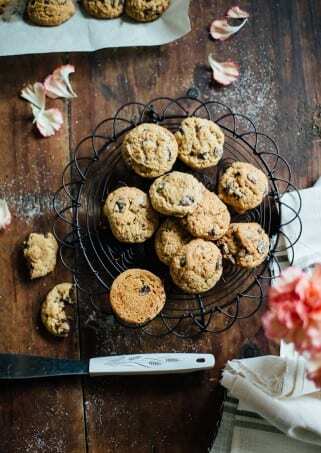 First, the recipe is straightforward, and when it is followed precisely, the cookies are simply fabulous. Second, and more important to a “recipe tinkerer” like me, this recipe is incredibly forgiving and accommodating of experimentation. For example, I have added peanut butter in place of the honey & butterscotch, and in greater quantity, resulting in a scrumptious PB-chocolate chocolate chip cookie. For a more intense chocolate flavor, I have made these with Dutch process cocoa, and I have also made them with Nutella in place of the honey for a delightful European chocolate-hazelnut flavor. All the variations and permutations which I have tried have worked out very well. The only ‘problem’ which I have encountered is trying to get all those chips to stay in the cookie dough. At about 2 ½ cups my dough is pretty maxed out. More chips than that and they start to fall out of the dough. I also use the cookie scoop method to portion out the dough on parchment paper, and that works exceptionally well. I would only suggest that anyone new to this recipe follow it closely for the first time or two before experimenting. Wow, never knew that about the vinegar – I always learn something new from you Emilie! And with whole wheat flour and honey these are healthy CCCs, right? Wow, vinegar?! Never heard of using it and now I’m going to have to try it! I love that you used whole-wheat flour too because I’m trying to lessen white flour in my diet. A great recipe as always! I have never tried whole wheat flour in cookies but I have wanted to. I was afraid they would come out tough. I am definitely going to try this recipe! They looks and sound amazing!! I was wondering if you think that Whole Wheat Pastry Flour would be ok here instead of the white whole wheat flour? Thanks to Heidi over at 101 Cookbooks I use whole wheat pastry flour in so many recipes as a sub for AP flour and generally I haven’t had any problems! I will definitely experiment with the vinegar. Lately I’ve been using spelt flour in my chocolate chip cookies. The results are delicious and even hubby and the boys liked them! White whole wheat used to be my go to, now it’s more spelt though.